An architect, a theater consultant and an acoustician walked into a bar. Just kidding. They did walk into the Fifth Street School on March 9, though, along with a sizable crowd of performing arts enthusiasts. The Smith Center, due to open in 2012, was the golden child of the evening. Project CEO Myron Martin was joined by architect David Schwartz, theater consultant Joshua Dachs and acoustician Paul Scarbrough for an installment in the Symphony Park Lecture Series dedicated entirely to the new arts center. Martin concurred. “[It’s an opportunity] to give people in our community not only the chance to build something, but to build something special,” he said. The three panelists were charismatic and the information they gleefully doled out was fascinating. How do you insulate a concert hall against the sounds of a nearby railroad? Well, you stick it on a three-foot slab of concrete, Scarbrough said. Oh, and there’s another foot-thick slab in the ceiling for the same purpose. No big deal. The Smith Center will include two buildings and three separate performances spaces. It will be the first LEED-certified performing arts center of its size. The exterior of the building will be sided in Indiana limestone, the same off-white substance used for the capital building. Each star dressing room has a window to the outside, ensuring natural light. The seating in the hall will follow a “stacked” design so each seat isn’t excessively far from the stage. For balconies, this necessitates a special warped construction that still optimizes acoustics and sight-lines for the upper levels. Sound-reflective surfaces selected explicitly for this purpose will exemplify audial quality as well. Other concessions had to be made based on the unique environment of Las Vegas. The ideal humidity for a concert hall, for example, is about 40 percent. However, as Scarbough pointed out, intentionally injecting Vegas air with that much moisture would create a dank, unappealing feel for patrons. Instead, designers restricted absorptive surfaces in the hall and installed an automated door system that can “bleed” sound off should the need arise. It’s really difficult not to be excited about something like this. Having a space designed to attract artists of exceptional quality is an incredibly positive step, and not just for the sake of entertainment. Betsy Fretwell, the city manager of Las Vegas, spoke briefly about the connection between the Smith Center and the continual efforts to revitalize the downtown precinct of the city. For more information on the Smith Center, visit the Symphony Park website here. For further stats and photos, check out an article here from the Las Vegas Review-Journal. New York City Ballet is concerned with birds other than just swans, it turns out. The company has recently been paying a lot of attention to a little blue bird that tweets. Devin Alberda, a member of the NYCB’s corps de ballet, used his Twitter account in a way that raised administrative concerns, and a potential social media policy is now included in ongoing contact negotiations between the company and the American Guild of Musical Artists, the dancers’ union. Boston Ballet is considering a similar deal. For any of you social media junkies out there, these issues of privacy versus transparency probably ring true. So what do you tweet about? Do pre-workout snacks or post-party escapades make the list? Do you think company directors or administrative execs should be able to issue guidelines about ethical Twitter use? I want to hear about it! Leave comments below, or (and you had to see this coming) hit me up on Twitter @lvdanceinsider. Want to read more? Find the rest of the story from The Wall Street Journal here. Nevada Ballet Theatre, alongside dancers from Alvin Ailey American Dance Theater, produced “The Tried and True and the New” on March 4, 5 and 6 at Artemus W. Ham Hall. True to its name, the concert included original works by George Balanchine, enthralling modern dance classics and the world premiere of an arresting new ballet by James Canfield. Timeless choreography to Gaetano Donizetti’s “Variations” was an auspicious start to the performance. The company, clad in in pastel pinks and magentas, executed the demanding steps well and did justice to the notorious (and sometimes notoriously nasty) choreography of Balanchine. Although changements en pointe are not enjoyable things to execute, Allisa Dale managed to perform them not only proficiently but gleefully, which is a feat in and of itself. Grigori Arakelyan pulled off the same trick with traveling pirouettes, consecutive tours and the like. They are difficult steps, and the audience knows it. The artistry comes in when the dancers can perform them effortlessly. The corps was captivating in its cohesiveness, lending the intricate choreography a sense of stability but remaining interesting throughout the piece. Musicality was undeniable; several sections showcased counterpoints, with one group placing an accent on the downbeat and another group doing the same on an upbeat. Too often, the results of this are muddy and incoherent. In this case, this was sleight of hand at its finest: it surprised the audience and was neatly concluded before spectators had fully come to grips with what had just happened. The effect was delightful. The straightforward unison sections were another high point in the variations. Watching Dale step gallantly in front of a corps of polished ballerinas executing nit-picky steps in sync was a thrilling and revitalizing experience, and one that is not easily accomplished. This also justifies the longevity and persistence of Balanchine’s work. “A Song For You,” choreographed by Alvin Ailey and danced by Matthew Rushing, followed “Variations” and was both a shift and a continuation. Horton may not be classical ballet, but the presence, control and quality of movement remained the same. 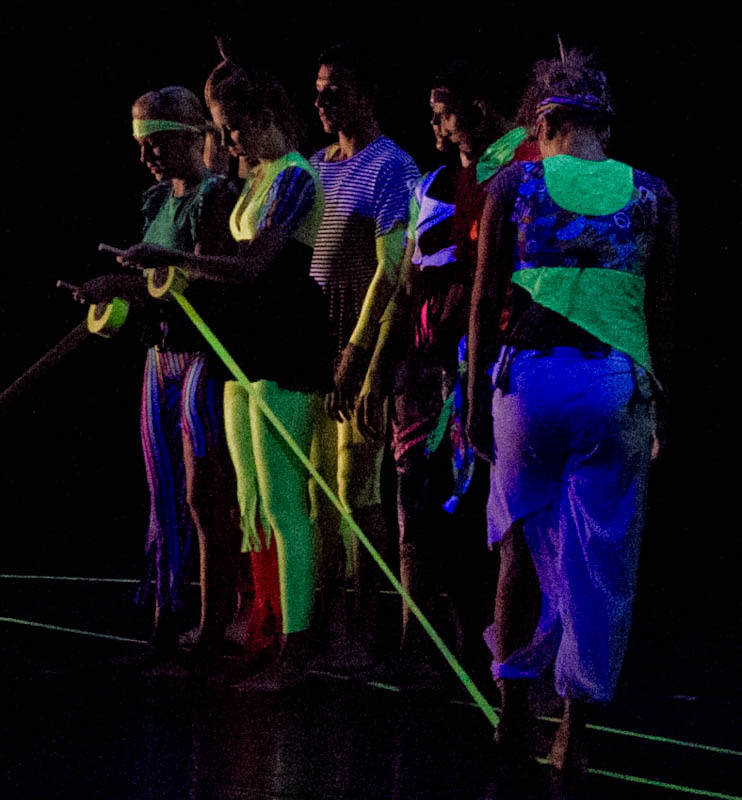 The modern energy, underscored by dramatic lighting changes, brought dimension to the show from the beginning and left the audience ready to clap at a moment’s notice. Rushing obliged with attenuated lines and committed stillness, completing the number with a bow of undeniable sincerity. In the second act, NBT divested itself of classical sensibilities and followed through with Rushing’s trajectory. 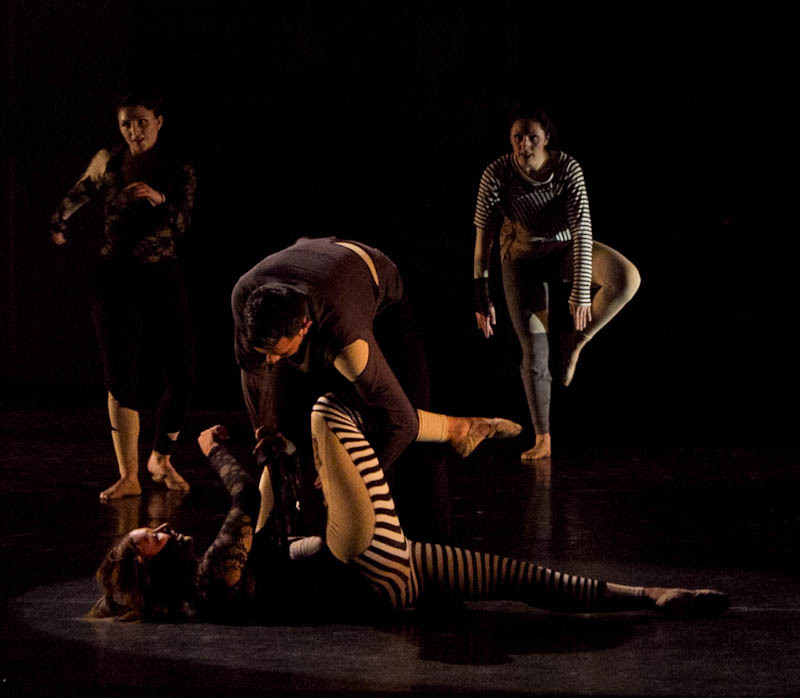 “Still,” accompanied by live music and choreographed by NBT’s Canfield, was an unpredictable foray into a world that was intriguing in its strangeness. Mary LaCroix, who partnered with Arakelyan, seemed to be enamored with the experience herself, maturely escorting onlookers through this foreign, unfamiliar thing. 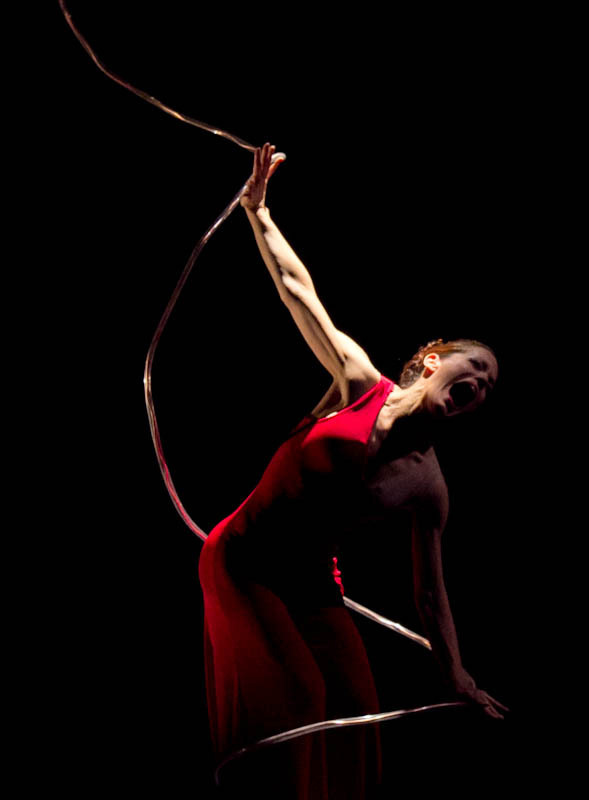 Arakelyan was strong and understated in the pas de deux work, which was utterly contemporary. The tasteful lighting, almost Victorian set and fabulously embellished music completed the emprise. Rushing joined Clifton Brown, also of Alvin Ailey, for a duet from “Concerto Six Twenty-Two,” choreographed by Lar Lubovitch and performed to a track by Wolfgang Mozart. The men mirrored each other with incredibly synchronization for much of the piece, synthesizing a tranquillity that could hardly have been more pleasant. The white costuming was classic Ailey and the blue wash of the lighting created an ethereal, spectral quality. Nearly flawless technique was the cherry on top. Forget the Balanchine. As a company, NBT absolutely sparkled in “At the Border,” filling a bare stage with insouciant energy, arcing jumps and far-flung limbs. Vitality radiated from the red- and blue-clad dancers and proved that, while they are fully capable of Balanchine classics, perhaps a contemporary groove is more fitting. Athleticism stood stoically beside technique and showcased the group at its finest. For more information about Nevada Ballet Theatre and upcoming performances, check out their website here. Find an article on the Jerome Robbins Foundation’s NEW program here. Las Vegas burlesque met Nickelodeon’s “Double Dare” on March 1 at FreeZONE, and it was was a pairing that has a lot of potential. 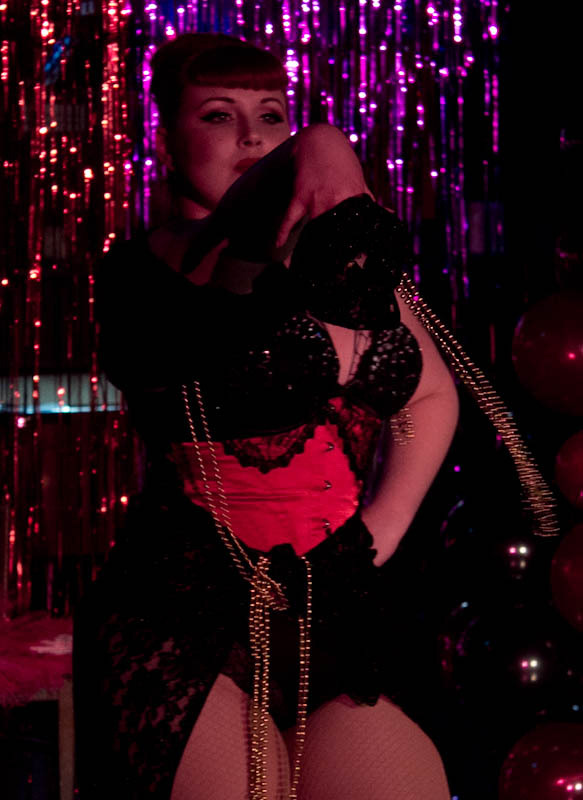 “Burlesque the Game Show,” organized by Miss Miranda Glamour and Nomi Malone, featured striptease performances interspersed with less-than-wholesome games and challenges for audience members. Prizes, and surprises, abounded. Lou Lou Roxy guested in the show as well, twirling a purple spiral-emblazoned umbrella and hypnotizing the audience with classic variety show vibes. In the latter half of the show, Roxy sprouted feathers and molted clothes, eliciting cat calls and tips. 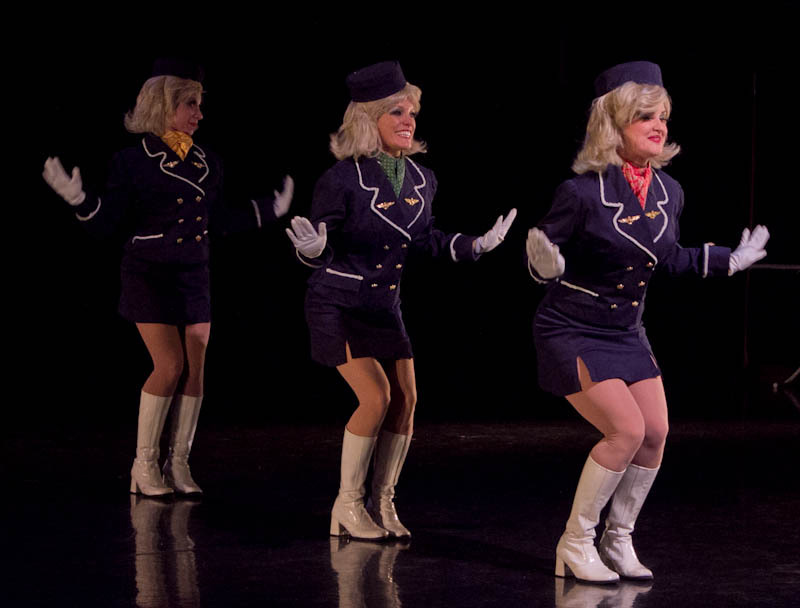 Nomi Malone also performed a number en pointe to Across the Sky’s “First Love Song,” which had been seen previously at February’s “Burly-Q Revue.” Despite a shoe malfunction and a stage that left plenty to be desired, the piece was well-received. Stage kittens Rosa and Porcelain Vanity assisted Glamour with such games as “Treasure Chest,” involving throwing Mardi Gras beads down a stage kitten’s shirt and “Milking It,” where liquid had to be squeezed through pinholes poked in the fingers of latex gloves. The festivities continued with “X Marks the …” well, I won’t print that here, but it rhymes with “spot” and is probably the most adult version of “Pin the Tail on the Donkey” that I’ve ever seen. The show ended with two audience members clad in ponchos of protection, diving face-first into bowls of whipped cream in search of three elusive cherries. Winning contestants received a $50 gift card to The Rack and two tickets, redeemable for any show, to the Onyx Theatre. Glamour and Malone are natural hosts, using brassy jokes and strong improv skills to cover minor holes in the show. Although turnout was modest and contestants had a habit of wondering off between rounds, the “Burlesque the Game Show” represents a good addition to the burlesque scene in Las Vegas. Momentum and an established reputation should also be helpful to subsequent performances. For your chance to win, hustle on down to FreeZONE the first Tuesday of each month. Enjoy the photos below in the meantime.